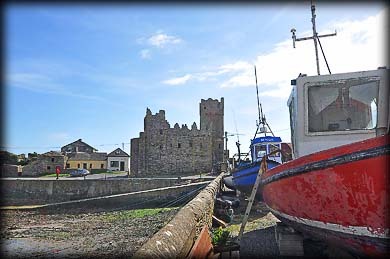 The 15th century five storeyed tower house and the adjoining 16th century two storey hall, dominate the picturesque harbour at Slade, County Wexford. 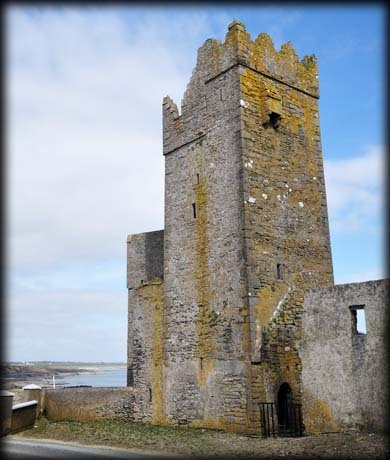 The tower house was probably built by the Laffan family. There are references to the Laffan family in the Hook area since at least the 14th century. The Laffans added the two storey defended hall sometime during the 16th century. 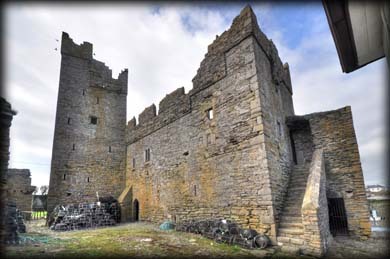 At the Suppression of the Knights Hospitallers’ manor at Kilcloggan in 1541, Nicholas Laffan held 120 acres in Hook parish. By 1666 the lands and castle were in the possession of Nicholas Loftus and later in 1684 Henry Loftus, who rented the castle to William Mansel. Mansel developed the nearby saltworks. 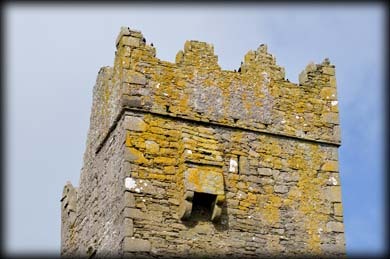 There is a round headed doorway, pictured below, in the south wall of the tower. It is protected on the exterior by a machicolation and protected by a murder hole on the interior. The main living quarters on the first floor were accessed by a newel stairs situated in the SE angle. On this floor there is a fireplace in the west wall and a garderobe chamber at the north end of the east wall. The annexe to the east end of the fortified house has a corbelled stone roof and was probably connected to the salt making industry. Situated: From Fethard on the Rink of Hook head west along the ring for Hook Lighthouse. After 8.5 kilometres take a left at the T-Junction. Follow the road to the harbour. Discovery Map 76: X 7457 9854. Last visit Apr 2015.